Do you have a soft spot for the oldies? A kind heart, a bit of time, some room to share with senior GSP? Then we’d love to have you become a Forever Foster home. 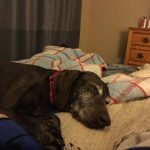 As a Forever Foster home, you sign up to to provide a loving home for a senior GSP knowing that he or she will remain with you the rest of their days. You’re happy to have a companion, a buddy for walks, a good listener. And you want to be the safe place for that dog to land, where they can be pampered and loved. Perhaps you are retired or on a fixed income - we take care of all the vet & medication costs so you don’t have to. Or you’d like a dog, but can’t make the 10 to 15 year commitment that a puppy requires - a senior GSP fits the bill perfectly. To become a Forever Foster, fill out our Volunteer Form. We’ll be in touch to answer all your questions and get you all set up for your new old friend. Please note: Forever Foster volunteers must be 18 or older.